Play Systems Are Used For Schools, Preschools, Community Centers, Day Care Centers, Apartment Complexes, Summer Camps And Other Outdoor Recreational Environments. Play Systems are made of high density polyethylene material and scratch-resistant powder coated steel finished components for long lasting safety, durability and dependability. Wide selection of variously configured outdoor play systems available. Various elements include Pyramid Roof or Canopy Structures, Slides, Stairs, Crawl Tunnels, Vine Climbers, Rung Climbers, Mountain Climbers, Bone Bridges, Rung Walls and Climbing Walls. Color configurations are Natural Green, Brown and Tan or Playful Red, Blue and Yellow as well as other combinations. ADA compliant. Capacities accommodate 8, 1, 15, 20, 23, 25, 10-15, 15-20 or 20-30 for children aged T-2, T-5, 2-5, 3-6 or 5-12. Dimensional sizes vary depending upon particular unit or configuration. Swing Sets Are Used For Schools, Preschools, Parks, Community Centers, Apartment Complexes And Other Outdoor Recreational Environments. 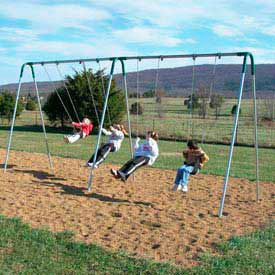 Swing Sets are made of sturdy 2-3/8 inch diameter galvanized iron toprails and legs for long lasting safety, durability and dependability. Include Blue or Green powder coated finish yoke connectors, swing hangers, S hooks and welded swing chains. Meet or exceed ASTM and CPSC standards for playground equipment. Single Bay units are available with 2 Tot or Strap seats made of durable EPDM rubber. Double Bay units are available with 4 Tot Seats, 4 Strap Seats or 2 Tot/2 Strap Seats. Bays measure 8 ft. width and height. 4 Ft. Freestanding Slide Is Used For Schools, Preschools, Parks, Community Centers, Apartment Complexes And Other Outdoor Recreational Environments. 4 Ft. Freestanding Slide is made of powder coated steel uprights and perforated, coated steel stairs for long lasting safety, durability and dependability. 3-1/2 inch diameter Slide is made of rotationally and blow molded plastic material with matching entrance. Safety stair and top entrance rails provide additional safety. Stainless steel hardware included. Colorful red, blue and yellow finish. 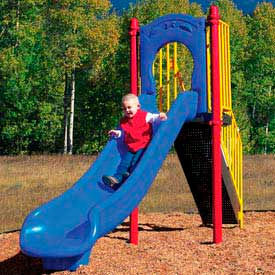 Measures 11-1/2 ft. L x 3-1/2 ft. W x 7-1/2 ft. H. Meets or exceeds ASTM and CPSC standards for playground equipment. Playground Climbers Are Used For Schools, Preschools, Parks, Community Centers, Apartment Complexes And Other Outdoor Recreational Environments. 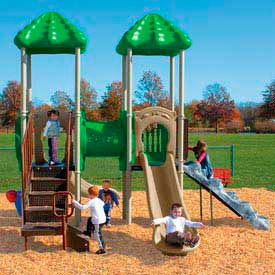 Playground Climbers are made for long lasting safety, durability and dependability. Horizontal Ladders are made of 2-3/8 inch galvanized zinc tubing with blue powder coat finish and are used for arm strength and endurance development. 2 sizes available. Freestanding Crawl Tunnel has green powder coated steel frame and rotationally molded plastic tube. Side portholes provide supervision capability and brightened interior. Easy-assembly and surface mount installation includes surface mount footers and ground spikes. 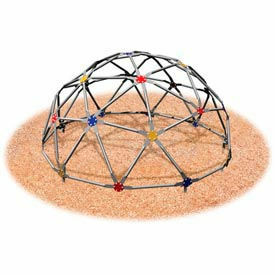 Geodome Climber is constructed of 1 inch diameter galvanized steel pipe with multi-color powder coated connectors. 3 ft. 6 in. height. 7 ft. 6 in. diameter. All climbers meet or exceed ASTM and CPSC standards for playground equipment. Zig-Zag Balance Beam Is Used For Schools, Preschools, Parks, Community Centers, Apartment Complexes And Other Outdoor Recreational Environments. 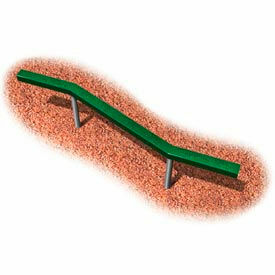 Zig-Zag Balance Beam is made for long lasting safety, durability and dependability. Punched steel construction with UV stable and impact resistant thermoplastic coating. Unique, nature-themed design measures Measures 4 in. W x 8 ft. L x 18 in. H. Green color finish. Meets or exceeds ASTM and CPSC standards for playground equipment. See Saw And Spring Riders Are Used For Schools, Preschools, Parks, Community Centers, Apartment Complexes And Other Outdoor Recreational Environments. 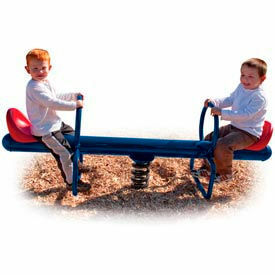 See Saw And Spring Riders are made for long lasting safety, durability and dependability. 2-Rider See Saw has blue powder coated steel frame and red injection molded plastic seats with high strength steel coil spring. Used for encouraging social interactive play activity. Measures 20 in. W x 7 ft. L x 30 in. H. Spring Riders have heavy-duty steel spring mounts with included concrete anchor bolts. Requires use of safety surfacing. Durable HDPE body. Horse or Truck designs measure 20 in. W x 3-1/2 ft. L x 30 in. H. All models meet or exceed ASTM and CPSC standards for playground equipment. Music/Sound Products Are Used For Schools, Public Parks, Day Care Centers And More. Music Wall and Fun Phones are made of fabricated steel, plastic tubing and HPDE Plastic for long lasting durability. Music Wall - 3 Panel - Freestanding includes bongo drums, 2 conga drums, 2 shakers, a washboard and a megaphone. Can be customized. Fun Phones are great for playgrounds. Color finishes are Yellow or Red/Yellow/Blue/Green combination. For children aged 2-12. IPEMA approved. Measurements vary per model. 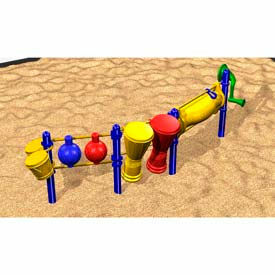 Sand & Water Tables Are Used For Playgrounds, Day Care Centers, Public Parks And More. Sand & Water Tables are made of steel posts, HDPE plastic body and steel basins for long lasting durability. 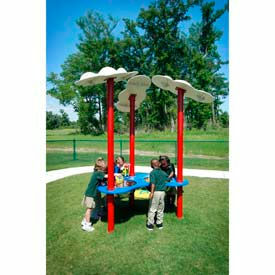 Sand and Water Table With Clouds measures 8 ft H x 3 ft W x 6 ft L. Color finish is Red/White/Blue Combination. Recommended for children ages 2-5. IPEMA, ISO 9001-2008 certified.